California based artist Johanna Spinks is this week's guest blogger for the Artist as Collector Series. 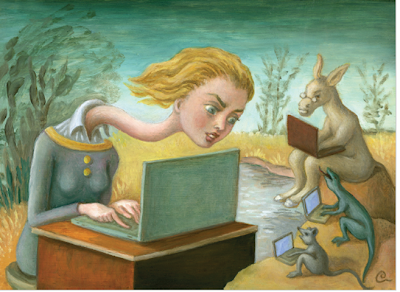 This painting by Amy Crehore was originally done as an illustration for an online issue of The Magazine issue 24, to accompany an article on female hackers written by my daughter Rosie Spinks. Rosie had told me the challenge of writing the in depth article and what a great illustration had been done for it. When I saw the image online I found it charming and whimsical, and appreciated her execution and color harmony. It's Alice in Wonderland-esque in the computer age. I was interested in purchasing the piece and went to Amy's site to see more of her work. She is a successful artist and most of her work had been sold. I didn't know if I would able to afford her, so I was thrilled when she sold me this piece for a price I could afford. I was also impressed by her overall professionalism. As a full-time artist myself, it is hard for me to look at my own art on my home walls at the end of the studio day, so I love to fill my home with other people's art. We were once evacuated from our home as we live in "fire country," and my collection was the first thing that went in the car, after the kids and dog! Amy's piece will be enjoyed among some great company for a long time. Johanna Spinks is a painter living and working in Southern California. The British born artist is as much a storyteller as she is a classically trained portrait artist. In 2013 she was awarded the Mayor's Art Award, Artist in the Community, Ventura, CA. Thank you Johanna... I loved seeing Amy Crehore's as well as your work, and of course learning about Rosie's article. I love the painting, and the concept- it is very much "Alice in Wonderland meets Computer!" Thanks, Nanci and Johanna, for the introduction to a fabulous artist! Thank you for visiting Sharmon, we can all relate the surreality of dealing with computerland, right? The artist Amy Crehore did a great job putting the idea to paper with color and content. Thanks again! #Joanna... am thrilled that Magazine picked up your post as well! In essence, I am a storyteller. Stories of events, as well as objects, flow in and out of my paintings, drawings and sculptures. What we remember, collect, save, and leave behind, all inform and inspire my work. I use my art to hold parts of life, finding the threads that entwine our experiences to examine identity, create meaning and build community. 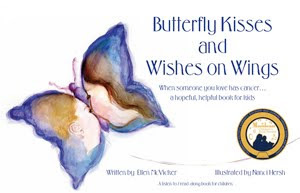 Our Butterfly Kisses Book has a Blog too!